Lyn Gardner: Why does support for emerging artists vanish once they have ’emerged’? Last week, Camden People’s Theatre’s outgoing executive director Amber Massie-Blomfield observed, very wisely, that not every small theatre has a big theatre inside it struggling to get out. Expansion may suit some, but small can be beautiful. Nonetheless, there is a difference between scale in terms of size, and scale of ambition. As money gets tighter and funding pots, whether from Arts Council England or Creative Scotland, are put under more and more pressure, one of the things that suffers first is ambition. You see it all the time: companies that began their careers making small shows are now, five or 10 years into their careers, still making small shows because that’s the only kind of work that they can get funded and get the dates to tour. A company might have begun its life at a venue such as CPT and looked gradually to build a network of relationships with other venues around the country. Now, a company like that often finds itself several years on still making work with limited resources and still performing in the same venues it started at. And still doing it on a box-office split rather than a fee. A considerable amount of support is available for emerging artists, but once a company has made a few pieces and is considered ‘emerged’ the support often drops away. The £500 here and there, or a couple of weeks’ free rehearsal space that feels like a gift to a graduate company, will make a company six years and three shows down the line feel significantly undervalued. It is exhausting always trying to make innovative theatre on limited resources – while also working two jobs to support yourself, on top of the hours of unpaid labour needed to access the funding for the next show. Oh, and also trying to book a tour. Lauren Mooney’s fabulous piece in Exeunt highlights just one of the perils that companies face every day when trying to book a tour, and in recent years it has become harder. Once it was possible to book a two or three-night run in many venues. Now companies are grateful for any dates including the lone one-night stands, often geographically far apart. These difficulties make it impossible for these companies to dream big. In fact, the funding system often seems oddly skewed against both ambition and letting the public experience the results of that ambition. Take the case of Two Destination Language, whose latest piece, Declining Solo, a show about ageing, finishes a tour this week at the Lowry in Salford. When the company set out to develop the show, it had been making work for six years. In those earlier days it very sensibly focused on work that could be toured easily out of a suitcase and in a car. 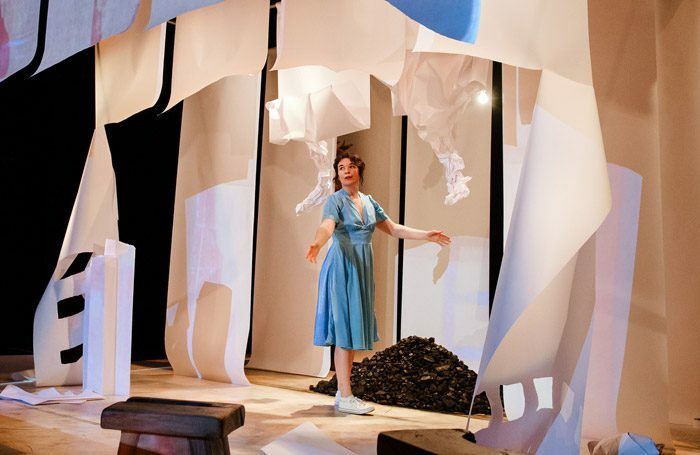 But after the success of Near Gone and other shows, venues were interested in supporting the company – with rehearsal space and technical support – to make the more ambitious work and also programme it. The company was successful in making two £15,000 applications to Grants for the Arts to research and develop Declining Solo, but a further application for money to finish the show and tour was rejected. What to do? Not tour and let down the other partner venues that had already supported its development and were very keen to put it in front of their audiences? Or tour it anyway, but work for free to ensure that the show gets seen and partner venues are not inconvenienced? In the end, the company took the latter course, and of course that is precisely what most artists do in these circumstances because they want to sustain relationships over a longer time. A funder is but one partner in the tangle of relationships any company has. I hear this kind of story over and over. The really absurd thing about it is that public money goes into developing work but then the public only gets to see it if the artists involved – or at least those responsible for making the application – are prepared to self-exploit and forgo a fee. The point about research and development is that it is exactly that. Not all shows will or should come to fruition. Sometimes what seemed like a good idea will turn out to be a very bad one. That’s what R&D is intended to discover. So there must be scope for applications to be turned down. But there is a difference between a system that is turning down applications on the grounds of quality and one that turns down applications to get the work finished and widely seen. The current system encourages companies constantly to R&D new projects without putting the means in place to ensure that the very best output of that R&D can secure the funding to finish and tour the work. The losers are not just artists, but the public too. Mark Shenton’s week: What makes critics disagree… or dance?